Coupling the feast of the eyes is a soundtrack that is reminiscent of some of the extravagant delights heard in Squaresoft's legendary Chrono Trigger on the SNES. There are one or two tunes in Rayman M which sound like they could have been loosely related, such is their quality. Superb graphics, wonderful orchestral music and, most importantly, totally addicitve and enjoyable gameplay combined to make it the best platform game on any system in year. It's a true "must have" game on the Playstation 2. Rayman has the sweetest sound and plays some sad, cool, funky, groovy, hip, kind, sweet, happy music. Always the levels fit to their music, and the sounds perfectly match to Rayman's moves. 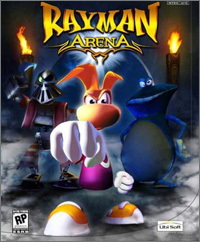 Move over Mario : Rayman is hitting the arena!